Sen. Phil Baruth presents proposed rules addressing ethics and financial disclosures. Figuring out how to self-police has proven challenging for the Senate. A stumble Friday forced its leadership to postpone action on rules to address ethical complaints and financial disclosures. An ethics rule would establish a five-member panel, with new members named every two years. The panel would investigate any allegations of ethical violations by senators. The Senate Rules Committee would establish the procedures that the ethics panel would follow. In fact, the committee already has approved a two-page procedure manual, but it had yet to be shared with all senators. Sen. Claire Ayer (D-Addison) jumped up to question why the ethics panel wouldn’t write its own procedures. 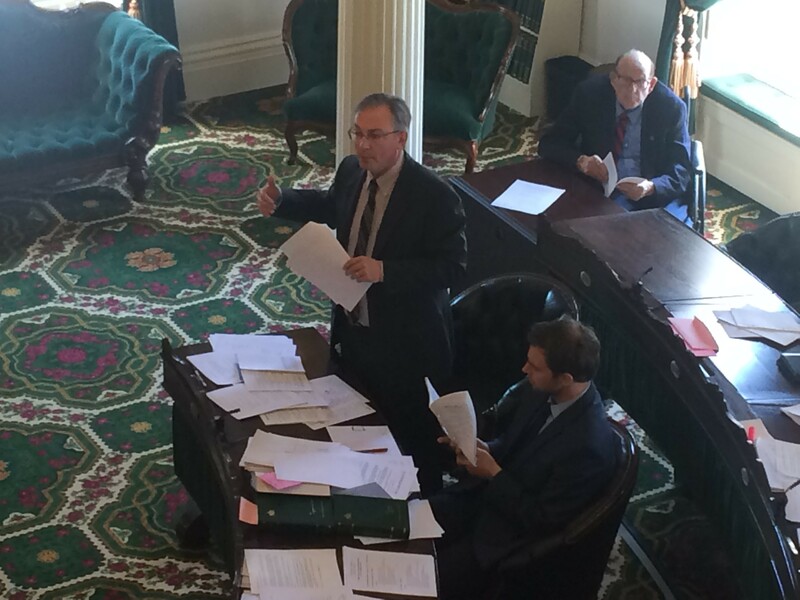 Senate Majority Leader Phil Baruth (D-Chittenden) replied that the committee chose to copy the way rules were established for a Senate sexual harassment panel. Ayer wasn’t satisfied. “Is it proper to propose an amendment that the committee on ethics would propose its own procedure and bylaws?” she asked Senate President Pro Tempore John Campbell. Of course, Campbell told Ayer. But he quickly called a recess to try to resolve the disagreement without a floor fight. Half the Senate joined the huddle at the front of the chamber. The group couldn’t seem to find a quick consensus and it was past lunchtime. When the Senate reconvened, Baruth asked to postpone debate and a vote on the two rules until Tuesday morning. “This is difficult work and it is clear that a little more work has to be done,” Baruth said. He invited senators who wanted to propose changes to either rule to come to a Senate Rules Committee meeting at 8:30 a.m. Tuesday, prior to the Senate session. Baruth had the Senate staff hand out the ethics panel procedures that the rules committee adopted. Baruth also told senators that the rules committee would try to have a recommendation concerning the disclosures that would be required under the second proposed rule. The rule says senators would have to submit a disclosure form at the beginning of each two-year-term — but the rule doesn’t specify what information must be disclosed. Baruth and Campbell have said they want the disclosure requirements for senators to square with what would be required of others under a bill establishing a state ethics commission. It calls for statewide elected officials and top managers in state government to disclose employment in which they earn more than $10,000, investments that produce income greater than $10,000 and boards on which they serve.